A classic that first launched in 1985 and has released again, the Air Jordan Original 1 (I) Black / Royal Blue was used not only by Michael Jordan and other basketball players, but skaters and BMX riders as well. 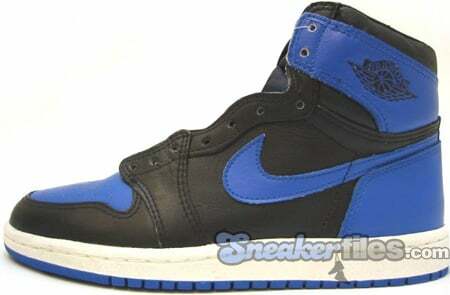 The Air Jordan OG 1 (I) Black / Royal Blue cushioning was top of the line in 1985, for high flying dunks to ollies. Also, the uppers of the Air Jordan Original 1 (I) Black / Royal Blue contain premium Black leather, with Royal Blue accents.